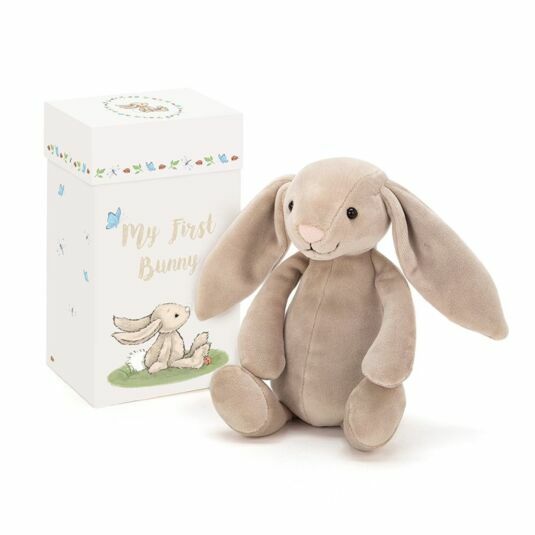 This adorable bunny from Jellycat has velvet-soft fur that is super snuggly and suitable to give to children from birth making him the perfect first toy for new born babies! He comes tucked up all snugly in a white box that is printed with gorgeous bunny illustrations. There is also a card inside, titled ‘My First Bunny’ with space below to write the date of birth, name and birth weight of your new baby. With bright eyes, beige fur and a little pink nose, this smiling, flopsy bunny is the perfect bedtime companion for your little one.